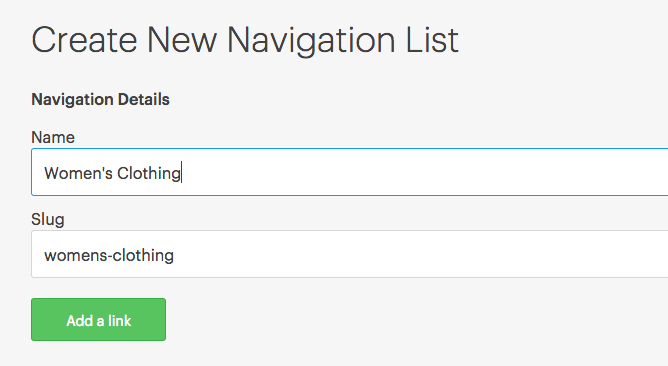 Create a Navigation in Vend Ecommerce – How can we help? Main Menu: This is the primary menu navigation for your store and is created by default. Depending on your theme, it might be at the top or the side of your page. Sub-menus: You can create multiple sub-menus. Sub-menus are used to create a drop-down within your main menu. For example, your main menu might have the option 'Women'. This would link to a sub-menu 'Women' which had your collections linked to it. Before you start setting up your menus, it is a good idea to draw or plan out your menu structure. This can save you loads of time as you'll be able to get a great idea of how you want your Navigation to look before creating it in Vend Ecommerce. The plan below was done on a computer but even just sketching one out on a piece of paper can be a big help. If you're: - Creating a sub-menu, click Add Navigation List.